The king of flip-flaps strikes again – and this time it’s seasonal. Get your fingers ready, fans! You’re at the farmyard Christmas party. All the animals are dressed in crazy costumes. Can you guess who is wearing each disguise? Peekaboo! Lift the flaps to see who’s who. Did you get them right? Rhymes, guessing games, bold colours, novelty fun. 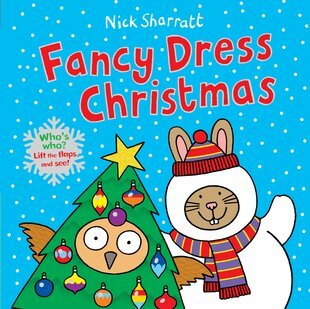 Nick Sharratt at his best.